The MGM musical SILK STOCKINGS (1957), starring Fred Astaire and Cyd Charisse, has been released on Blu-ray by the Warner Archive. SILK STOCKINGS was based on the Cole Porter Broadway musical; the musical in turn was based on the Melchior Lengyel story which was the basis for MGM's 1939 comedy hit NINOTCHKA (1939), starring Greta Garbo and Melvyn Douglas. Close to two decades after Garbo's success as Ninotchka, MGM obtained the Broadway rights for SILK STOCKINGS and resurrected the story for one of the studio's last big musicals. In fact, this was the final MGM musical in which Astaire starred in the leading role. Watching him in a succession of dances, a viewer would be hard pressed to believe the man was nearly 60! Astaire plays Steve Canfield, a movie producer who plans to film his latest musical in Paris. The movie will feature addlepated swimming star Peggy Dayton (Janis Paige), who can no longer swim due to ear troubles, and the score will be written by Russian composer Boroff (Wim Sonneveld). Unfortunately the Soviet Union wants its composer back, and three commissars (Peter Lorre, Jules Munshin and Joseph Buloff) are sent to Paris to retrieve the composer and bring him back behind the Iron Curtain. Instead the three men fall in love with Paris and invent reasons to remain in the city. Soviet Commissar Markovitch (George Tobias, reprising his Broadway role) then sends straight-laced Ninotchka (Charisse) to Paris to herd everyone home from the City of Light. Once again, things don't go as planned, as Ninotchka fairly quickly falls for both Steve and the pleasures of Paris. Given all the talents involved, including director Rouben Mamoulian, I've always felt SILK STOCKINGS could have been better. At times it feels underdeveloped, not to mention silly; for instance, I like Janis Paige, but her character seems like a bit of a tacked-on misfire here who's not essential to the story. Nor does the bland Metrocolor photography by Robert Bronner help; the movie's Paris is strictly a backlot affair, filmed in muted hues. Porter's score is not his best, though it has some moments, with "All of You" a classy standout. A plus in this department is the film's typically lush MGM sound, with Andre Previn conducting Conrad Salinger's orchestrations. Despite my criticisms, the movie has stood up to numerous viewings by me over the years. I find Charisse's deadpan line readings amusing, and there is some simply splendid dancing, including two of my all-time favorite MGM musical numbers, "Fated to Be Mated" and "Red Blues." The former number, choreographed by Hermes Pan, is a bouncy dance for Astaire and Charisse through a succession of movie sets; it's pure joy which leaves the viewer smiling as broadly as Astaire and Charisse do in their final clinch. (And watch for Charisse's skirt to magically change to culottes!) "Red Blues," choreographed by Eugene Loring, is a high-energy dance with some terrific fancy footwork by Charisse. Both dances make great use of the film's widescreen Cinemascope framing. In the end, SILK STOCKINGS provides 117 minutes mostly spent in the company of Astaire and Charisse, and that's a good enough reason for me to pull this film off the shelf for another look every so often. Those who feel the same way will enjoy this new release. The Warner Archive Blu-ray is a good-looking, clean print; it may not be as dazzling as some of the Archive's other recent Blu-ray releases, but I attribute that more to the fact that the film's color wasn't especially vibrant in the first place. The extras from the 2003 DVD were reproduced on the Blu-ray, including a featurette, shorts, and a trailer. Essential to the plot or not, Janis Paige steals this one from its necessarily passive leading lady. Particularly the "Glorious Technicolor" number. Janis is definitely energetic. :) Funny thing, I think I enjoyed her in it more in the past, but now I feel impatient to get to Cyd Charisse and the dancing LOL. Thanks for adding your two cents! Well, that's where your romance is. Paige was set for bigger stardom, but had the bad timing to star in Doris Day's first movie in support. When Paige did PAJAMA GAME on Broadway, Doris did the movie. Always loved this musical and you describe it so well. 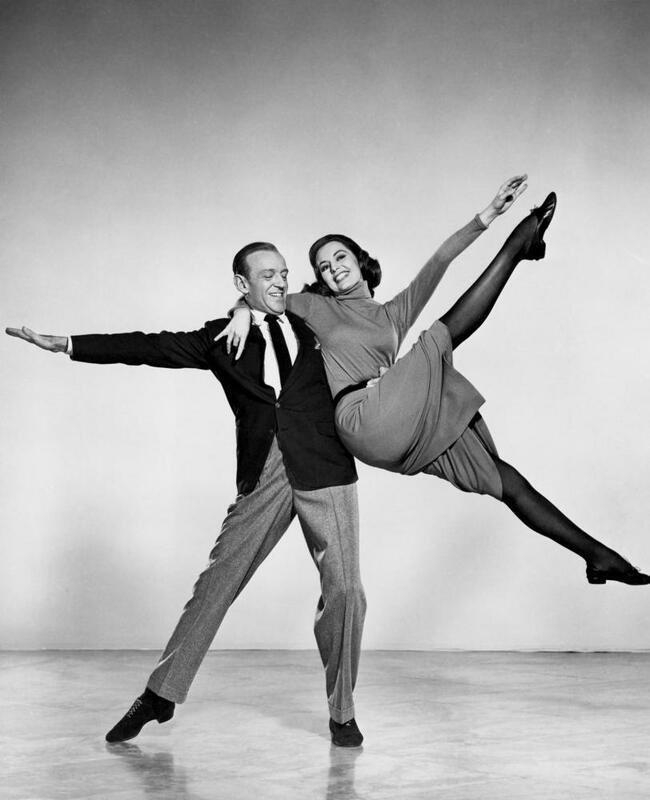 Astaire's age just doesn't show and Charisse is a sensational dancer. Love Janis and agree it was shame she didn't get to the Pajama Game film - much as I love Doris. A pity Janis didn't have a bigger film career. 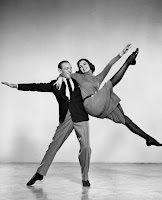 It's funny about those dance numbers you single out--while I like "Red Blues" very much, I think the clear standouts are the Astaire/Charisse duet to "All of You" (great song!) and Charisse's solo with the stockings (I guess this is "Silk Stockings")--Charisse is mesmerizing (OK, that's kind of a redundant word talking about her) in that second one. I more or less agree with you about the movie--never felt it was great, though there are wonderful things in it so it's easy to come back to once in awhile. And truthfully, I'm not that enamored of "Ninotchka"--some will say it's heresy, but I'd rather watch Charisse than Garbo, not to say she's better in the role but she is well-cast, even apart from her dancing. Fortunately, for lovers of musicals, Astaire and Charisse had already had their moment together. "The Band Wagon" is one of the greatest of all musicals, about as good as a musical can be, especially of that "backstage" type. I agree, I wish Janis had done more. She's one of several '40s Warner Bros. actresses I really enjoy who never seemed to burst into the top ranks. Blake, enjoyed your feedback! Although my favorites are the fast-paced, athletic dances I singled out, I agree, all the dancing is terrific, and the two numbers you mention are excellent. Your comment sharing your favorite dances helps illustrate why I keep going back to the movie -- there's really a lot in it to like, even though I always wish they'd been able to take the film as a whole up to the next level of excellence. Couldn't agree more about THE BAND WAGON, which I revisited at the TCM Classic Film Festival but haven't had time to write about. That was one of the first musicals I ever saw in a revival theater, around age 9, on a double bill with SINGIN' IN THE RAIN. It made quite an impression back then, and it only gets better on each successive viewing. Perfection. 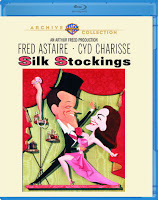 Much as I love Astaire and Charisse, SILK STOCKINGS is just a bridge too far for me. I think I've only seen it once, didn't care for it, and haven't sought it out again. I've seen bits and scenes and numbers, but never the whole thing again. Certainly agree about THE BAND WAGON. I'm constantly back and forth between that one and SINGIN' IN THE RAIN for my choice as best screen musical of 'em all. Certainly don't agree about NINOTCHKA which is one of the greatest screen comedies ever. And Garbo is luminescent. For me, the most entertaining thing about SILK STOCKINGS is watching poor Peter Lorre trying to manage even the simplest of choreography. Believe me, I know how he felt. For almost 5 decades onstage, choreography was the continual looming bane of my existence. Thanks for adding your feedback on the films we've been discussing! I always enjoy the color your theater anecdotes add to the discussion. Are you still actively acting, or have you retired? Thank you, Laura. I am happily retired. I had one offer to make a brief return from retirement. it was, because of the money and the prestige, somewhat tempting, but I resisted. It did prove that I'm not totally impervious to being dragged back in, but clearly the situation would have to be darn nigh perfect. Meantime, I get to watch loads of movies, so that's a good thing.